We are here for him now...but Ari saved himself. 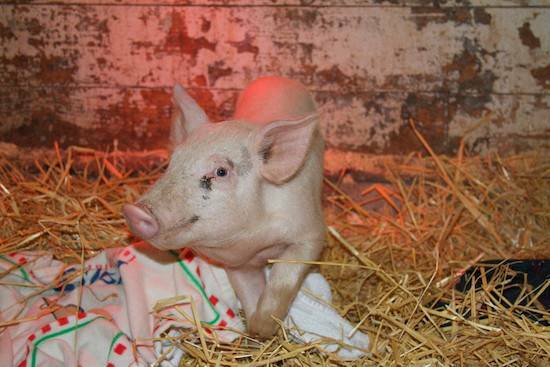 I am writing this having just returned to my desk after warmly welcoming our newest resident, Ari the piglet. He is shy and scared but will soon realize that he's safe and that we won't hurt him. 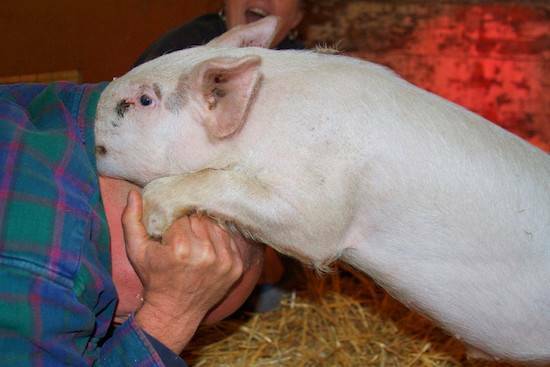 A fraternal lodge in New Jersey was raising him to be killed for a "pig roast." I am heartbroken that people could be around this sweet 10 week old piglet and see him as food. But Ari escaped somehow -- maybe someone felt mercy and let him out the door. He ran through the woods until a wildlife rehabber was able to catch him and take him to the local shelter. They cared for him while we arranged for veterinary inspection so Ari could cross state lines. He arrived just hours ago in a dog crate in the back of a car. It will take a while for him to settle in...but he is warming up to love and attention, even crawling under Caregiver Todd's shirt collar! I feel so lucky to be one of those few people whose job it is to care for survivors like Ari. Because of so many rescues like this, and the incredible support friends like you always provide, the past 18 months that I've been here at Woodstock Sanctuary have inspired me beyond words. We wouldn't be here doing this work without you. Ari wouldn't be here without you. Thank you.